A new zingy twist on a classic salad ingredient. 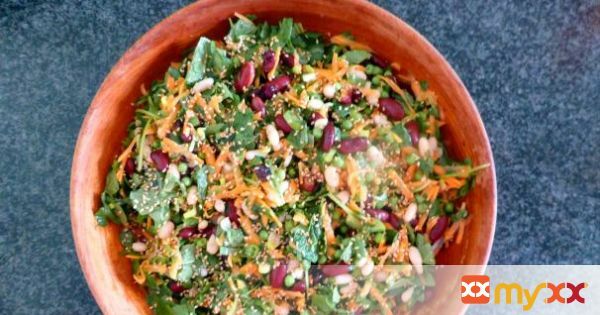 This filling salad, that's easy to prepare can be eaten on the side, or on its own makes a great lunch! 1. Place all the salad ingredients (except sesame seeds) in a bowl, and mix them through with your hands. 2. Mix the salad dressing ingredients together, pour over the salad and mix through, and sprinkle the sesame seeds over the top. 4. Use other beans or pulses, chickpeas work well, butter beans. Try swapping the peas for sweetcorn. Green beans are nice too, so if you have any leftover, cut them up and mix through. 5. This salad can be eaten on its own, but if you wish, try serving with some baked salmon filet, sunflower seeds, or other seeds can also be added to the salad for extra crunch.